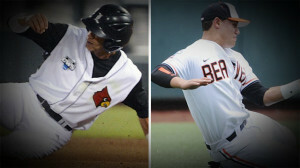 The Oregon State Beavers faced the Louisville Cardinals in the first losers bracket game of the College World Series on Monday afternoon, capitalizing on multiple defensive miscues by Louisville to oust the Cardinals from tournament play in an 11-4 victory. The Beavers would strike first, scoring three runs in the third inning off of Louisville staff ace Jeff Thompson. The three-run rally would begin on a Tyler Smith RBI double that would score Max Gordon, which would be later followed by a Danny Hayes ground out that scored both Smith and Andy Peterson due to a fielding error by Louisville second baseman Zach Lucas. Bringing a 3-0 lead into the fourth, the Beavers would once again capitalize on fielding errors committed by the Louisville defense, wherein Oregon State would score seven runs in the inning to extend their lead to 10-0. The seven-run effort was ignited on a Dylan Davis RBI infield single that scored Gordon and Peterson. Kavin Keyes would ground out to short, but an errant throw by Sutton Whiting allowed Michael Conforto and Keyes to score. A bases loaded walk to Jake Rodriguez would score Danny Hayes, to be followed by a two-run single by Gordon to drive in the sixth and seventh runs of the frame. Despite the fact that only three of the seven runs allowed by Jeff Thompson were earned, the Cardinals ace would only last 3 2/3 innings and receive just his second loss of the entire season. Meanwhile, on the mound for Oregon State was Ben Wetzler, who was solid in a must-win situation for the Beavers, working 6 1/3 innings. Wetzler left the game with one out and two runners on in the seventh, wherein reliever Scott Schultz would allow both runners to score, closing the gap for the Cardinals who would go on to score three in the inning and make it a 10-4 game with two innings left to play. Despite the three-run burst of energy in the seventh, the Cardinals would surrender an RBI double to Michael Conforto in the bottom of the frame, increasing the lead to 11-4 and sealing a victory for the Beavers. With the victory, the Beavers stay alive in the NCAA Tournament and send Louisville home, the first team to exit Omaha in this year’s tournament. Oregon State will face the loser of Monday night’s contest between Mississippi State and Indiana on Wednesday night.